It’s back to school time! Here at the University of AFF, we want to help you to make the most out of our best student resources: the new website! Roll the mouse over each photo to reveal a little surprise! The easiest way to get acquainted with the website is to explore the main navigation bar and it’s drop down menu. As you roll over each menu item, you’ll discover how things are grouped together on the new site. About Us: If you’ve ever wanted to meet the staff, learn about our mission and programs, or volunteer at AFF, than this section is for you. 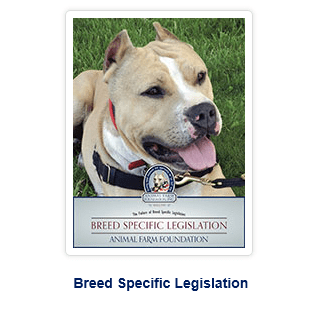 Resources: Here you’ll find almost everything you’ve ever wanted to know about how to care for and advocate on behalf of “pit bull” dogs. Really. If you work or volunteer in a shelter or rescue, are a community advocate, or live with a dog, this section has something for you! See below for a detailed guide to the largest section of our website. Programs and Events: This section has information, applications, and resources related to our grants, the assistance dog program, and our internships. Learn about our humane education programs, then check our events calendar to find us in a town near you! Multimedia and Publications: This is a fun section with a lot to do and tools to use! 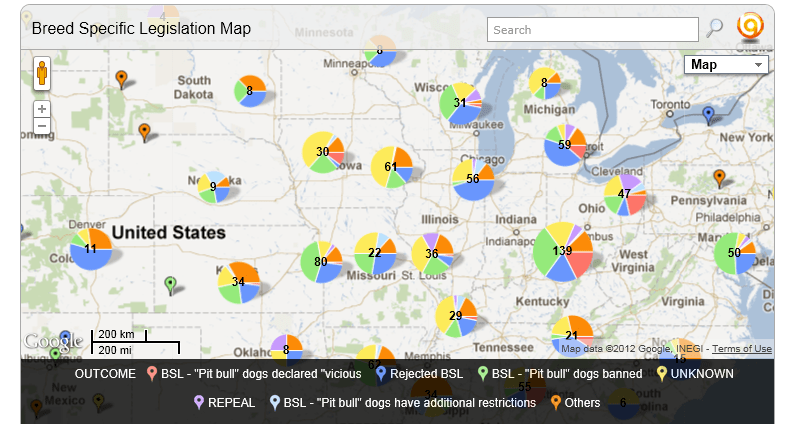 Explore the interactive BSL map to find out what’s going on around the country. Download and read our helpful eBooks, then print and share them with your local shelter, rescue, or advocacy group. Browse our historic photo collection and infographics. Request freebies like posters and trading cards for your shelter and events. Find out about the projects we’ve been working on and off the Farm. Plus video highlights and some of our favorite reads. 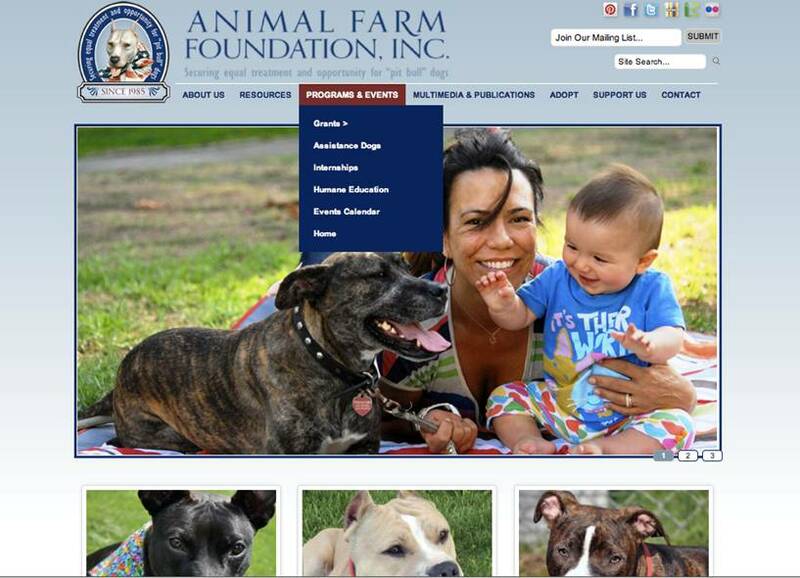 Adopt: Don’t miss your chance to meet the available dogs at AFF. Fill out an application to bring home your new BFF and find out how to care for a new dog. Plus, you can get all of your questions about living with a “pit bull” dog answered here in our FAQs. Support Us: Shop our store or donate to our wish list. Thanks! Contact: We like to hear from you. This is how you can reach us. Class, the bell is about to ring, so let’s move on to the next lesson: Resources. Our new website is a big one, encompassing a ton of resources to aid you in your work with “pit bull” dogs – whether you’re a shelter staffer or a new adopter. You can dive right in and spend an afternoon reading, but we want you to have a study guide to this mega-section, so you won’t miss a thing! Before you get started in this section, it helps to know: who are you? Don’t panic – this isn’t a Philosophy 101 class. You just need to know who you are in relation to the dogs. 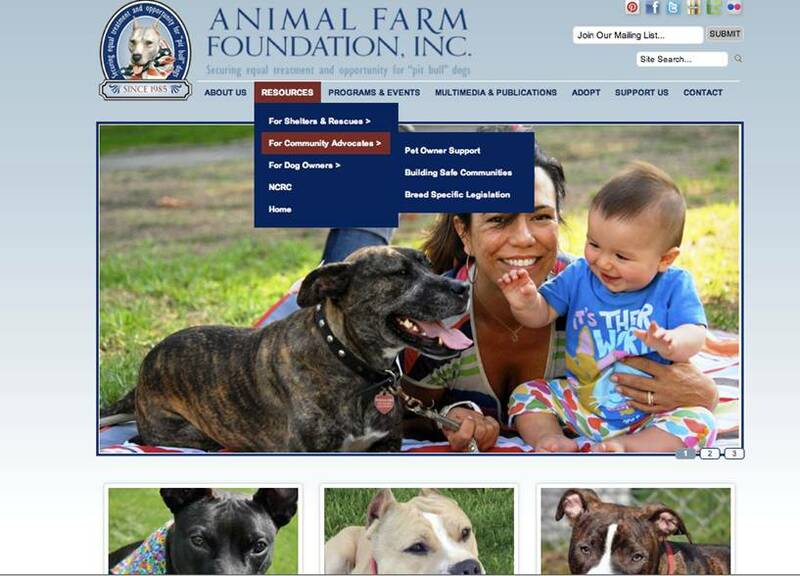 Are you a dog owner, a community advocate, or a shelter/rescue worker? We know that many of you are all three (A+ for you overachievers! ), so we hope you’ll explore all of the sections, but we’ve discovered that there are three main groups that visit our website. Which one are you? You work with shelter dogs and need assistance with dog training, kennel enrichment, labeling dogs, marketing, and increasing adoptions. 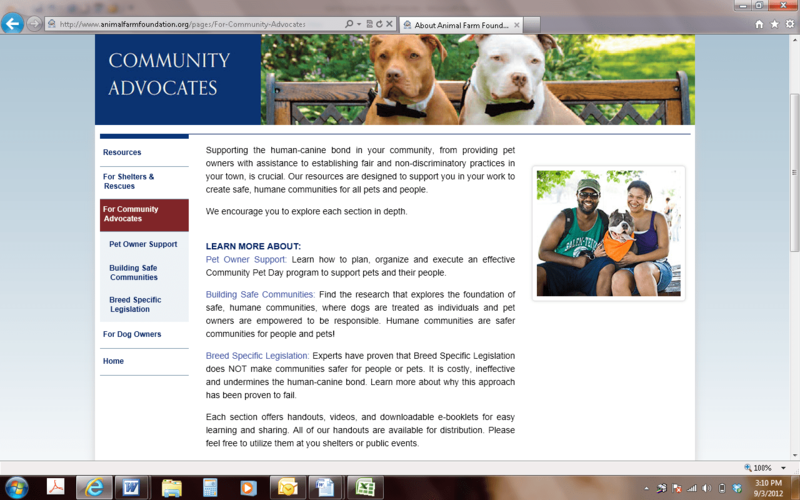 You are advocating for change in your community and want to learn more about providing owner support, challenging BSL, and responsible pet ownership laws. 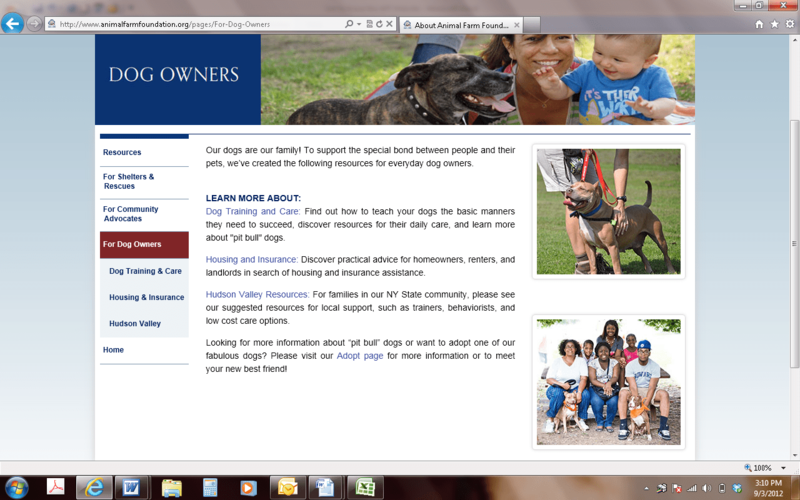 You have a dog at home or want to adopt one and would like to know if “pit bull” dogs are the right match for your family, how to train and care for your dog, and where to find help with housing. In this section you’ll find easy to download eBooks about each subject listed above. We hope you’ll save, print, and share this information with your staff and volunteers! The eBooks are formatted for easy sharing, so don’t be shy – spread the knowledge around in your community! The info in each section is available to download and print as an individual handouts or you can download the eBooks on each topic. The eBooks are a great resources if you want to share this information with local officials, advocacy groups, and anyone working to affect change in their community. Please read, then pass along these eBooks. They were built to share! And don’t miss our easy to download eBook that teaches humans how to teach their dogs Basic Manners. You can print individual pages for specific commands or the whole book to use as a training guide! You’re a shelter worker and you need some ideas to help you provide easy, everyday enrichment for your dogs. 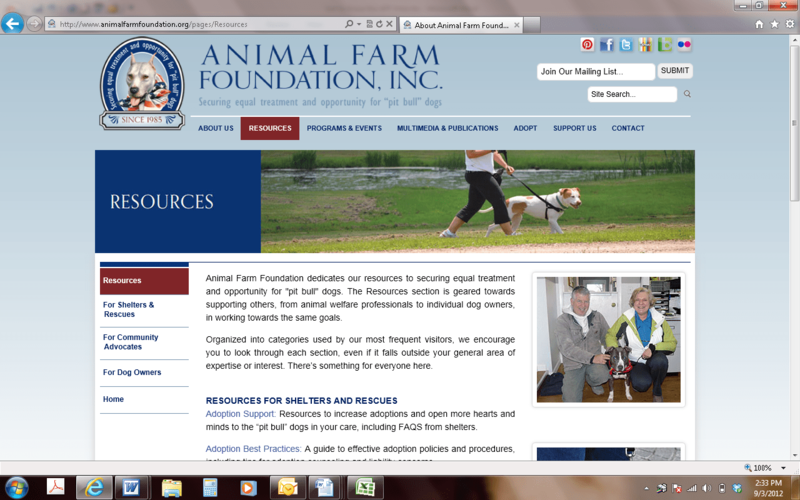 You can use the main navigation and drop down menu to go to: Resources, then For Shelters and Rescues, then Kennel Enrichment. 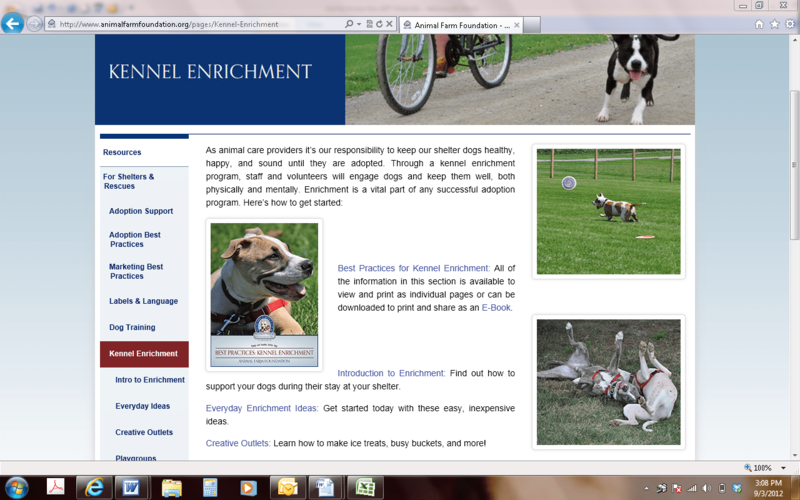 Back to our example: To find easy ideas for kennel enrichment, you’ll click on Everyday Ideas seen above in the sidebar menu. Mission Accomplished! And if you get lost (or just can’t stand using a menu! ), don’t forget to use our search bar at the top of the page. Phew! That’s a lot to take in and the bell is about to ring, so that wraps up our Website 101 class! Please put down your #2 pencils. 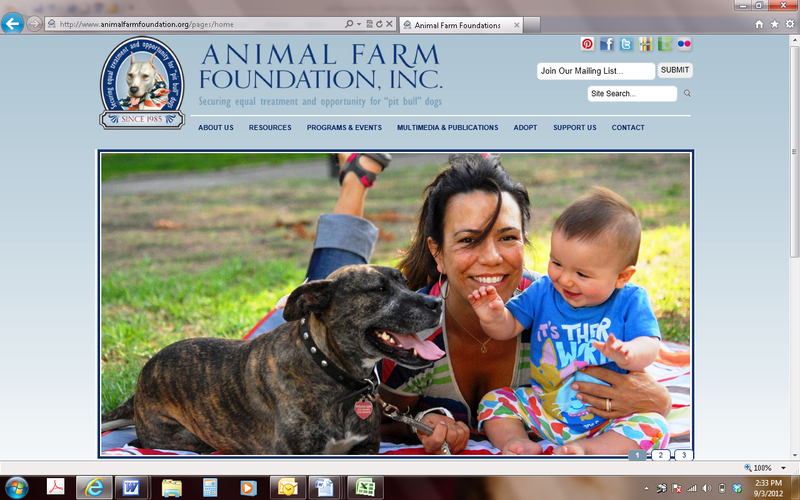 The new Animal Farm Foundation website is designed to be a one-stop destination for the tools and research you need to secure equal treatment and opportunity for the “pit bull” dogs in your life and work. We hope that you find it helpful and if you have any questions or need a hand with your homework, you can always contact us.